It occurs to me that, when operating correctly, gardens are really about recycling. In an ideal world we use the discarded leaves and grasses and turnip tops and return them to the soil. 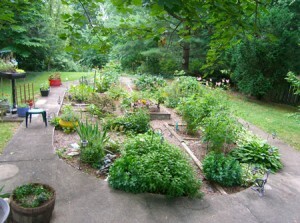 They help nourish the new growth, the season ends, the next year we enrich the soil again, with last year’s nutrients. Whenever I am showing people my grassless garden, more often than not it will end up with a tour of the compost pile(s). For several years running now, I have held onto every leaf that fell into my yard, and tried to compost them. 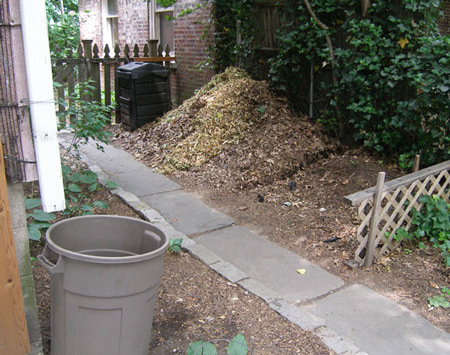 By the end of the fall season, the piles are admittedly a bit overwhelming and I have occasionally had to resort to satellite compost piles in the yard…. but by spring it has always cooked down to a neatly managed amount. I generally have several vintages of compost going, the 1st year pile and the 2nd year pile, which goes on the garden in the form of new dirt. Because we get a lot of roots in the pile, I end up sieving the compost to ”make dirt”. My daughter helps me with this and we get appropriately dirty in the process. The first year pile gets turned several times -we just did it a few weeks ago. Turning helps to consolidate the pile and in spring we usually need to add to it so turning helps to get it packed down. 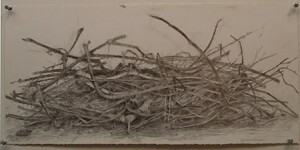 My artist friend, Christine Hughes shares my enthusiasm for compost- here is one of a series of compost drawings that she has recently done. There are leaf piles and then there is kitchen compost. I love being able to keep my food waste down by composting. In an effort to promote this diversion from the waste stream, black plastic composters were being distributed by the city a number of years ago, and I use mine all year long, trekking out in the snow to empty the tub I keep on the counter. But for recycling, nothing beats my mom’s garden. I helped her stake her plants last year, and the assortment of poles she used to do this consisted of every mop or broom handle she had used in the last 10 years. There are various repurposed containers around with plants in them, but her real claim to recycling stature is the garden itself. When my parents retired to this home in Maryland 25 + years ago, it had an in ground pool. Neither of them ever used it. Figuring that it was perfectly sited for sun and convenience to the house, my mom had it filled in and created her dream garden. From the back deck you can see the oval outline of the concrete walkway that used to surround the pool. She has enjoyed it far more thoroughly than she ever did as a pool, and the concrete surround makes it accessible even in mud times. 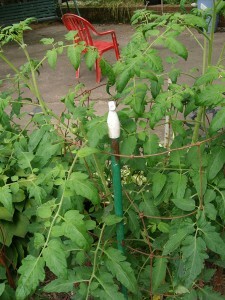 This entry was posted on Wednesday, May 2nd, 2012 at 2:46 pm	and is filed under In the Garden, Olive Green. You can subscribe to any comments to this entry via RSS 2.0. Comments are currently closed, but you can trackback from your own site.